Fifty-two years ago, Dr. Martin Luther King Jr. delivered his “Beyond Vietnam” speech at the Riverside Church in New York. One year later, he was assassinated in Memphis, TN. Even before his assassination, the US government sought to discredit him, arrested him 29 times, and attempted to drive him to suicide. King was killed for leading a revolution of love against the triple evils of racism, militarism and economic exploitation. He saw a direct connection between the war machine – rolling over the bodies and spitting out the souls of soldiers and civilians alike – and the destitution that empties bellies, crushes hopes, and sends ever more people to kill and die. War and poverty feed each other in a never-ending cycle. Racism and dehumanization keep the war machine turning, and prejudice and segregation are forms of warfare in themselves. King saw these connections and knew that equality and recognition of dignity for all could never be achieved as long as humanity is held captive to the thrall of violence and the myth of redemptive war. Dr. Martin Luther King Jr. was killed for leading a revolution of love against the triple evils of racism, militarism and economic exploitation. The Powers that Be use war as a tool of enrichment and control, but, though war is a tool manipulated at the expense of the poor, many who never see the profits or freedoms it promises nevertheless believe in it. Violence has been an effective tool for “keeping the peace,” insofar as it unites people within a nation against a common enemy. The power of violence to channel unity and cohesion has been harnessed both consciously and unconsciously, and most people with faith in violence believe that there is a greater good for which war may be the only tool. But ultimately, war blinds us to the humanity of others while eroding our own humanity. Dr. King knew this. He was effective at teaching this to others. And those who would rely on war for their own gain felt threatened not merely by King’s words, but by his ability to channel an awakening from the myth of redemptive violence, a myth on which nations build their identities at the expense of others, a myth on which nations are upheld at the expense of their own poor. It was Dr. King’s commitment to the eradication of war and poverty as well as racism that sealed his fate. The following video is excerpts taken from a sermon called “Why I Am Opposed To The War In Vietnam,” preached a few weeks after his “Beyond Vietnam” speech on April 30th, 1967, also at Riverside Church. The challenge Dr. King’s words pose, as well as the hope for a future beyond violence that they ignite, are more pressing today than ever before, as permanent war is rendering our very planet uninhabitable. Along with the video, I have some brief notes on how Dr. King’s words (in bold) spark my conscience regarding today’s conflicts. I feel particularly convicted by these words when it comes to speaking up for Palestine. I have done it before, but I know I don’t do it often enough for fear of being labeled anti-Semitic. But I believe that the policies of the Israeli government that violate the rights of the Palestinians directly conflict with the values of Judaism. I believe if Dr. King were alive today, he would speak out against the injustice in Palestine – the checkpoints, arbitrary arrests (especially of children), the home demolitions, and the starvation, confinement, and frequent bombings of Gaza. He would do so with a love that would call upon the conscience of Israel’s leaders and upon the conscience of the policy makers in the United States who, in the name of funding Israel’s security, actually enable violence that makes Israel less secure while denying Palestinians freedom and autonomy. While it is impossible to know Dr. King’s exact thoughts, I am certain that he would recognize and condemn injustice while seeking to redeem the people who perpetrate it. He would partner with Jewish and Palestinian peace activists, condemn equating critique of national policy (whether that of Israel or the United States) with anti-Semitic bigotry, and help the world to envision a future in which Israelis and Palestinians live side-by-side in peace, equality, and mutual respect. Of course, Dr. King would speak out against every war in which the United States participates, and he would unequivocally condemn the state of permanent war in which we are entrenched today. He would chastise not only the silence that comes from fear, but the silence that comes from exhaustion, complacency, and apathy. He would help us see the connection between these endless wars and our own lives – in a practical, material sense but much more in a spiritual sense. He would awaken to us our moral responsibility to devote ourselves to the healing of communities, nations, the very planet we all share. He would whet our appetites for peace and justice with a vision of a future so beautiful that our hunger for it could not be satiated until we fully committed ourselves to making that vision a reality. Of course, Dr. King himself was silenced for his dissent. And then his legacy was whitewashed, so that his challenge to the government would be obscured by a false narrative. Today, his memory is celebrated as if his vision of peace has been fulfilled and the salvation of the nation has been achieved, even as racism remains entrenched in our foundation, our militarism casts a shadow that reaches across the entire world, and the yawning chasm between the rich and poor grows ever more deep and deadly. Less than a year after condemning the silencing of dissent, Dr. King himself was silenced. Now, his memory has been whitewashed. But King would want us to look beyond himself to all who are hushed or maligned for speaking and acting in truth and justice against the lies of dehumanization, greed, and imperialism. Names that immediately come to mind are Colin Kaepernick, Chelsea Manning, and Ilhan Omar. I think of the ways they have been condemned and vilified for challenging the established narrative and drawing attention to the abuses of the United States at the expense of the vulnerable or marginalized. Of course, there are countless others whose names we do not know, arrested for protesting war or police brutality or inhumane immigration policies or lack of access to quality, affordable healthcare or education. See the 2020 budget proposal, which increases military spending and cuts almost everything else. A nation of crumbling infrastructure, where health is jeopardized by poor air quality and polluted water especially in impoverished – and often minority-populated – neighborhoods, where resources are diverted from education and housing and job-training and cultural enhancement… this is a nation that breeds hopelessness. It also contributes to a poverty draft that supplies the military with the personnel needed to fight more wars that continue to destroy people and communities for the power and profit of a few. I have called previous budgets under this administration “the budget of death,” but the truth is, funding for war has increased, to the detriment of social programs, under previous administrations as well. The demonic suction tube has been draining resources from social good into a vortex of destruction and death for generations. It is shameful the way that so many people appropriate Martin Luther King’s legacy to police the boundaries of dissent while failing to acknowledge the violence of our wars for the evil that it is. Any defense of war in the name of humanitarianism is at best a failure of imagination and at worst a cynical avoidance of an obvious truth. Every war is a war on children, bombs never discriminate between the “innocent” and the “guilty,” and our own violence is just as destructive and devastating as any other. We cannot claim to be beyond violence when we are waging military operations in 40 percent of the world’s nations. The irony is ludicrous. If we value peace as we claim, we must take a long, hard look at ourselves and repent. I, too, love America. I love the place where I live, because it is where the people I know also live. But other lands have loved ones, ideals, dreams. I desire not to stand out, but to stand with, the rest of the world. We can only rehabilitate our planet together. And yet, the nation from which violence has extended the farthest must also be the nation to reach out just as far with healing. It’s not so much that I want America to be the moral leader after all the destruction she has caused. It is more that I know that the steps we must take must be giant ones, which would necessarily draw the attention of the world. For our love to reach as far as our thirst for power and wealth, we must take extraordinary measures. These are some of my thoughts as I listen to King’s words today. What are yours? More importantly, how will we come together to fulfill the potential of his entire legacy – not just the parts most convenient to a false narrative of redemption that our nation has yet to make true? What will we do now to make Dr. King’s dream of justice, equality and peace our actual future? 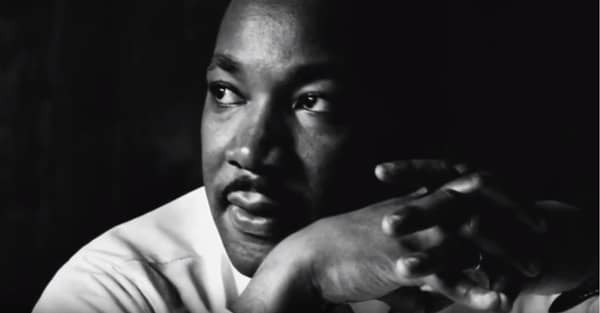 Image: Screenshot from Youtube: “Letter from a Birmingham Jail – Martin Luther King Jr.,” by Justin Ashurst.